From the lower Hopkins valley, cross the Hopkins river and ascend the scree-filled gully leading north east toward the summit of the outlier of Glen Lyon to access a 500m high alpine rock slab. So we just pick up a line and climb the slabs and had a great day on the rock, thanks to share this mountain with all of us. However we started climbing 100m up the gut (no any snow left) and climb the pretty obvious diagonal corner to what we think is Derek's escape ledge and from there up a pitch with route 2 and traverse right (crux) to the arete. From here up another 2 pitches to the top ridge. We thought we climbed a new line and wanted to let you know. We called "vote for pedro" and it's a pleasant grade 13 with one pitch of 15 in the middle, we left a piton there too. From the lower Hopkins valley ascend the gully leading north east toward the summit and climb the 500m high alpine rock slab from left to right, topping out near 1900m contour. 8-10 pitches crux 14-15, alpine grade 3+. 8-10 pitches, crux grade 17. Six pitches (crux 14/15) to the outlier, short scramble and two abseils off. Follow a wide crack followed broken by ledges just right of a huge overhanging scoop. Stemming crux is through overlaps, grade 15. 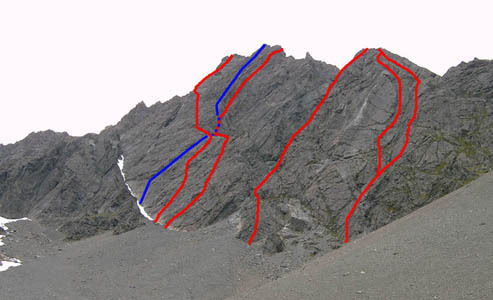 A four pitch climb that begins lower on the face. First pitch is a stunner, 40 metres of bomber incuts and high steps with just enough gear. One pitch scramble to the outlier summit and a 50m abseil to the exit gully. 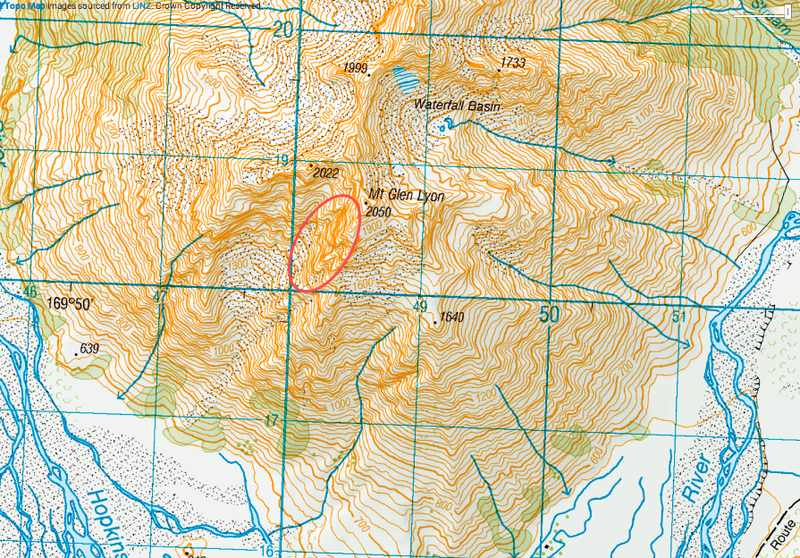 From the Dobson, follow the stream up to Waterfall Basin and then head south to gain the col at 1900m on the east ridge. Follow the ridge to the summit. 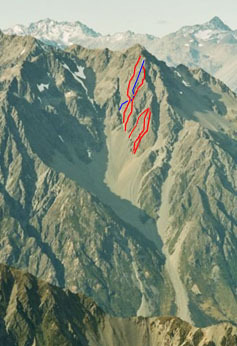 The descent was made from the col via a gully system to the south keeping to the true left of the prominent ravine. Several small bluffs and head high scrub were encountered in the lower section.